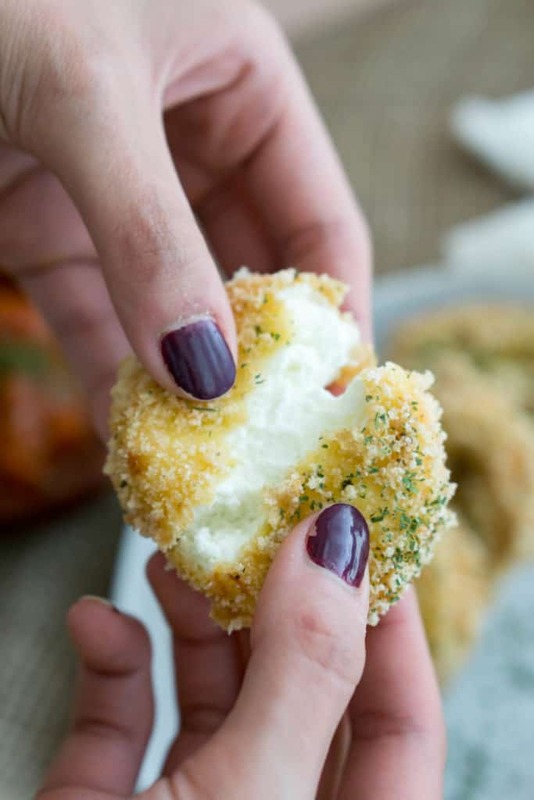 I didn't know Fried Goat Cheese was real until I saw it on Pinterest as I was scrolling for inspiration! As soon as it presented itself I knew I had to ketofy it and try it for myself. Once I did, Matt and I both tasted it and looked at each other in awe. "Is this real? It's crispy on the outside and soft and creamy on the inside." Well, the rest is history and now you can make it at home yourselves with our help! When you eat out at a restaurant, unfortunately they aren't using the best frying oil, in fact it's probably the worst kind! However, when you are frying at home you have the option at your disposal and we always recommend and personally use coconut oil. We buy it in bulk because there is never a day we don't use it. Another good option is lard, which we have used before and if you are simply pan frying something ghee is a great option. Ghee and coconut oil have high smoke points and work great for frying! ​This fried goat cheese has become our favorite low carb appetizer as of late. We make it for ourselves when we know we are about to settle in to a good show, for keto and non-keto friends and to take to parties where we know we may not have many good options. 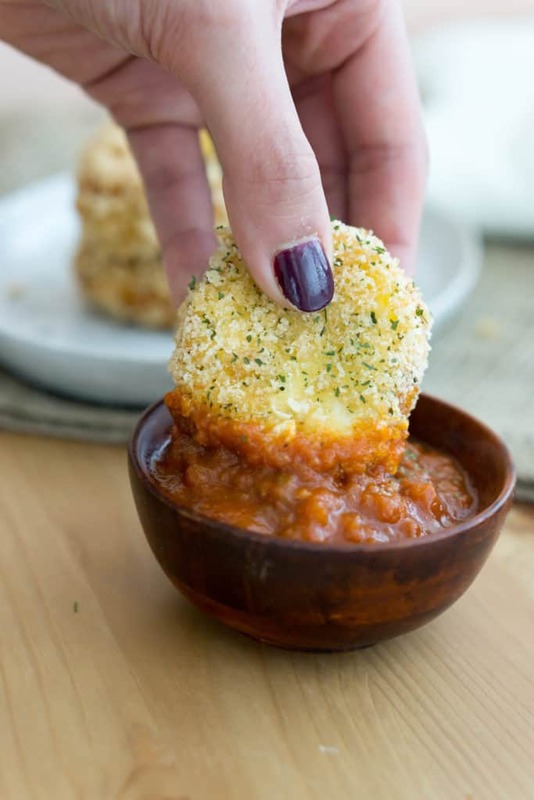 Another couple of our favorite low carb appetizers can be found on our blog, such as Parmesan Crisps, and Buffalo Chicken Dip that you can serve with veggies or our flax seed crackers! This will be our low carb appetizer go to moving forward because it satisfies all mouth feels on every level. With a crispy, crunchy outside and a smooth, creamy inside you can never have enough. It serves great with any dipping sauce of your choosing, but my personal favorite is Raos marinara sauce, a low carb sauce that can be found in local grocery stores! Give this fried goat cheese a try before you knock it. 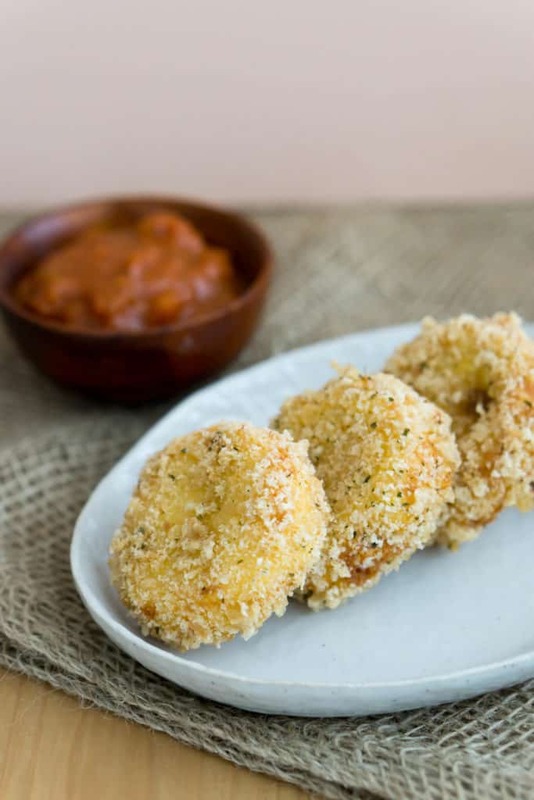 Recipe can be quickly added to MyFitnessPal - Search "KetoConnect - Fried Goat Cheese"
Add coconut oil to a small saucepan and heat on medium-high heat. Place a thermometer in the oil to keep track of temp. Place coconut flour in a small bowl, whisk two eggs into a second bowl and add the ground pork finely to a third bowl. You can easily grind the pork rinds by adding to a zip top bag and crush them. Cut the 8 ounce log into 8 even pieces and place on a plate. One at a time coat the goat cheese in coconut flour, egg wash and then pork rinds and place back onto the plate. When the coconut oil has reached 345 degrees add two goat cheese to the oil and cook for 30 seconds. Gently flip and cook for an additional 30 seconds. Remove and set on a plate with a paper towel. Repeat until all goat cheese has been fried. NOTE: we find keeping the oil between 330 and 350 degrees is the best for frying. You can do this by turning the heat up and down as you see fit.